Magnetic power above 100 MT/m2. Magnetic Pole Size: 50 x 50 mm. Perfect safety in case of power failure. No electricity needed to Keep the Electro Permanent Magnetic Chuck ON. Unobstructed movement of cutters during machining. Uniform clamping over entire area, such no chattering of tools there by improving finish and tool life. Electro Permanent Magnetic (EPM) Chuck are most suitable for heavy duty milling operations on small, medium size and even rough components. A minimum of 8 alternate magnetic poles contact is necessary for optimum clamping. Minimum thickness of job being clamped magnetically should be 10 mm. 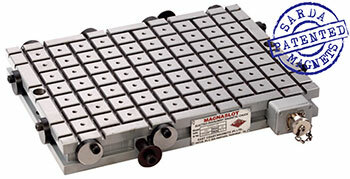 All five faces of the job can be machined in the same setting if clamped magnetically. EPM Chuck is easily integrated with Pallet changing and FMS Systems. AUTOMATIC SHIMMING: Spring Loaded pole extensions allow to clamp and to support uniformly work pieces even with bent surfaces achieving high accuracies of planarity. The Magnet can be designed for 220/380/400/480 VAC, 50/60 Hz. Custom designed solutions also available. for Controller details, kindly visit the EPM Controller page.